You know how sometimes you really don’t feel like doing something, but you think it’d probably be good for you if you did, so you force yourself to get on with it and then it turns out it WAS a good idea after all and you feel better for it? But I thought, no, this will be GOOD for me. Make me pretend I’m fine and maybe I will be. And I was. Because despite the Law Of Sod following me to Oxford station and presenting me with two trains and a rail replacement bus for a perfectly straightforward one-hour journey (resulting in two and a half hours to get there), I had a really nice time. And possibly prevented Susie from going into complete meltdown panic on the way there (“Oh God! I’m not going to make it in time! I’m going to arrive all breathless and unprepared half-way through!” Me: “Hey, but you’re not dead! Everything else is a bonus!” That’s motivational, right?). The panel at the base of the impressive Waterstones staircase! 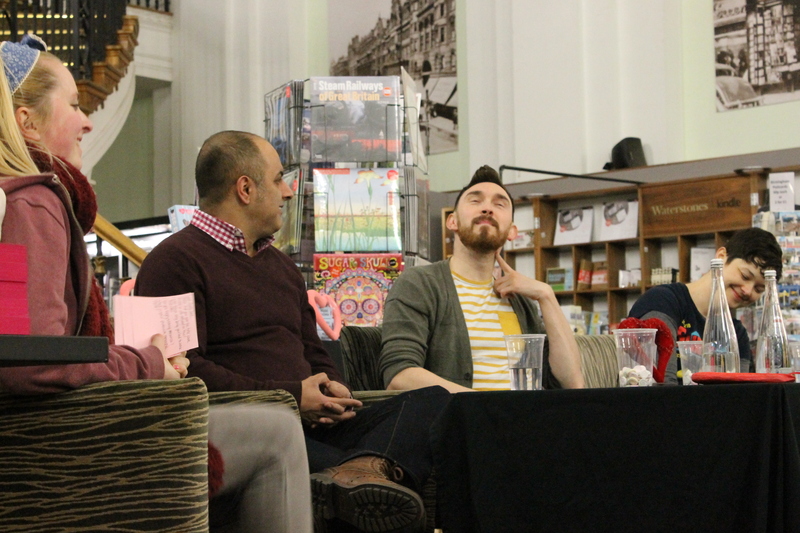 On the panel with Susie were the lovely James Dawson and Bali Rai, both of whom can come to dinner at my house any time. 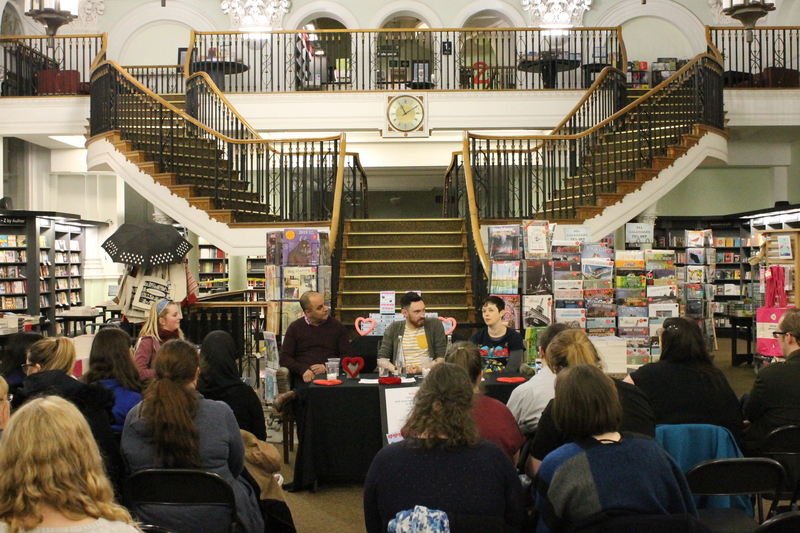 And chairing the event was Alice from Waterstones New Street, who had prepared a number of really lovely romantic questions based around love and Valentines Day, most of which got torpedoed by the panel and taken off into weird and wonderful anecdotes. Love Hurts (out now, edited and fronted by Malorie Blackman and published by Random House) is a sort-of anthology, by which I mean that it is a collection of stories, some of which are extracts from full-length Young Adult novels, and some of which are brand-new, specially-written short stories. James and Susie have both contributed new stories, and the brief was ‘love against the odds’. There was much discussion of disappointing Valentines Days, what the idea date might be, and how in fiction you have to throw in as many crises as possible to make things interesting, whereas in real life, what we really want is something easy and enjoyable… but that makes for a dull story! I have not yet read the book, but from the feedback I’ve picked up, it’s extraordinarily good at covering all kinds of love in all kinds of situations. There are many things that I think need changing about society, but goodness, am I glad I live in the NOW and not in the THEN. 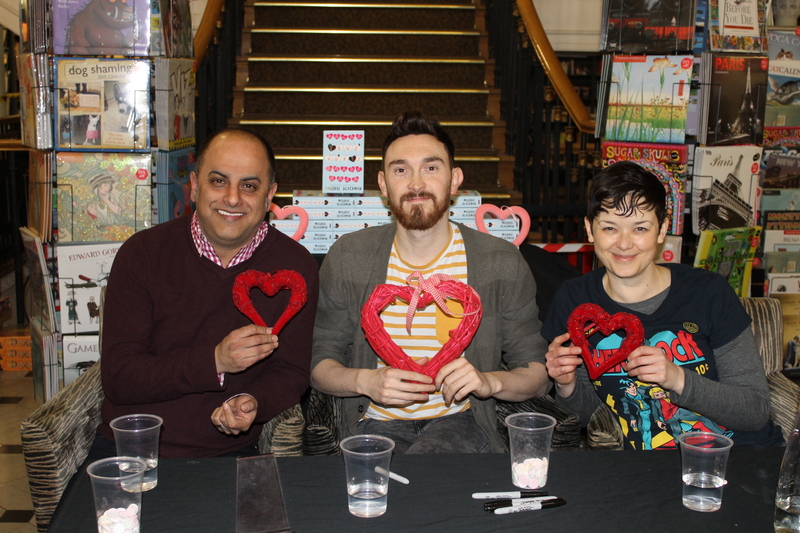 That so many people are now comfortable with love in relationships that used to be frowned upon is a hugely positive thing – and that books like this are being published is also a Positive Thing. Waterstones New Street is a beautiful store too, with a stunning staircase (sadly unavailable for dramatic entrances at the moment due to being declared Structurally Unsound – but you can still ADMIRE it) and the staff were lovely. And there were lots of bloggers there too – and I tweeted a bit, which you can find on my timeline somewhere. Love might hurt, but it also uplifts, supports and makes us more than we can be on our own. And no one should feel bad for loving. Hopefully lots of people will read this book and feel less bad and more supported. Because although we’re heading in the right direction, society, we’re not there yet.